In October 2018, Dan Cathy, Chick-fil-A, Inc.’s chairman & CEO, Rodney Bullard, Chick-fil-A’s vice president of Corporate Social Responsibility and Executive Director of the Chick-fil-A Foundation and leaders from the Mercedes-Benz Stadium together announced plans for the first annual Beloved Benefit. This Thursday, March 21st, the plans will come to life. On that evening, residents of Atlanta’s westside, local nonprofits, community and business leaders and celebrities will come together for a common purpose – to celebrate, honor and support the work being done to transform the Westside community. Read the op-ed from Rodney Bullard below to hear more about the vision of the Beloved Benefit and some of the organizations that will receive funding through the event. Last week, plans for the inaugural Beloved Benefit were announced to more than 150 community leaders gathered for the bi-weekly Transform Westside Summit. Led by Dan Cathy, Arthur Blank and Ambassador Andrew Young, the Beloved Benefit is a celebration of Atlanta’s diversity and sense of community, and a fundraiser to uplift distressed communities like Atlanta’s Westside. Inspired by Dr. Martin Luther King, Jr.’s adopted vision for the Beloved Community, the event will be held on March 21, 2019 and bring together those who have been doing the hard work of transforming the Westside of Atlanta. Businesses, nonprofits and residents of the Westside will be there, side by side, to celebrate the progress that has been made and those who have been leading the way. The organizers have committed to hosting this event for the next three years to create something sustainable. One hundred percent of funds raised will support organizations and residents who are revitalizing this historic community. Chick-fil-A is honored to come alongside many of these organizations as they create pathways to success for this community. Since hosting our first youth summer camp at Morehouse College in 2012, Chick-fil-A has invested more than $40 million in funding to Westside organizations. However, our investment in this community involves more than dollars. It has been a true partnership with on-the-ground community organizations where Chick-fil-A staff serve as board members, give their time and talent to volunteer efforts and the Chick-fil-A Foundation provides programmatic and strategic counsel. At-Promise Youth Center, Grove Park Foundation, Westside Works, City of Refuge and Westside Future Fund are a few of those on-the-ground organizations. Each of them is dedicated to creating sustainable change. Each of them has produced inspiring, tangible and ongoing results. And that’s why each of them was selected, among others, as beneficiaries of the funds raised at the 2019 Beloved Benefit. The At-Promise Youth Center has become a national model for the relationship between a city’s police department and the community it serves. Operated by the Atlanta Police Foundation, it has served more than 800 youth in the English Avenue neighborhood since opening just over one year ago. Providing wraparound services from GED courses to trauma assessment and counseling to mentoring by Atlanta police officers, its aim is to reduce crime by creating resources for these youth, rather than placing them in the juvenile justice system. So far, it has been working. Crime in the area has been reduced by 40 percent. Building on initial funding, the Chick-fil-A Foundation is currently providing much-needed meals to the students and their families every Friday. City of Refuge has been a diligent laborer in the Westside for more than 20 years. It has created a network of services addressing some of the community’s most pressing needs, like hunger, economic access, housing and programs for youth. 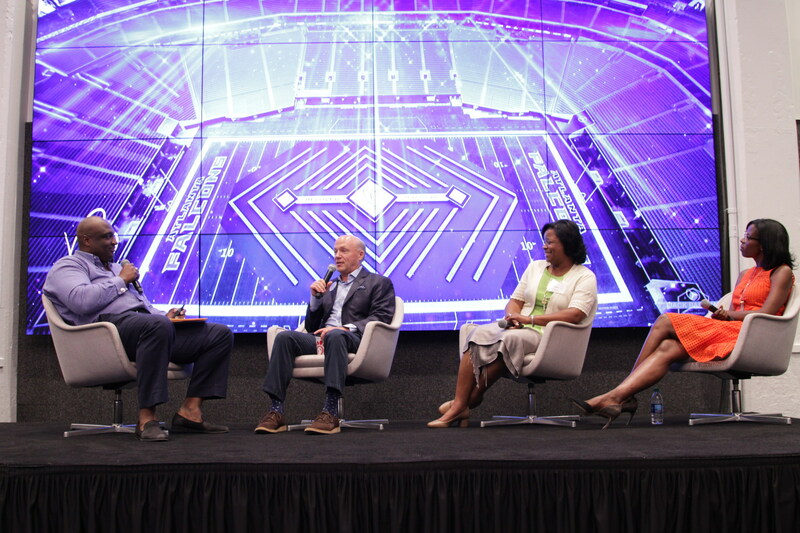 As a long-time partner we were proud to add to our investment and contribute to the collective funding effort, along with the City of Atlanta and Muhtar Kent to produce the Workforce Innovation Hub in 2016. The new facility is training residents for sustainable employment in fields like automotive, culinary arts and bookkeeping. That same funding is now being put toward constructing a new apartment building for the community that will break ground this month. Westside Works has also been doing its part to create economic opportunity for Westside residents. It’s providing vocational training, job placement and paths to employment to careers including certified nursing assistant, construction and IT. The impact is measurable. To-date, more than 470 residents have been placed in full-time jobs, with 81 percent retention of those jobs after one year. In total, those who have come through Westside Works have earned more than $12.4 million in wages. Supporting Grove Park Foundation was an essential step in our support of this community. Working arm-in-arm with individual residents and neighborhood groups, the Foundation focuses on bringing resources to the Donald Lee Hollowell corridor. Through a community-led and engaged approach, it has become a part of the fabric of this community. To-date, they have worked with other non-profits to repair homes of long-time residents and have secured funding and training to aid residents in purchasing homes. Beyond that, they have been instrumental in bringing new developments to the corridor, including Woodson Park Academy, a new Atlanta Public School, a YMCA Wellness Center and affordable housing. In the same way, Westside Future Fund has continued its efforts to address needs and create opportunities for four Westside communities—Ashview Heights, English Avenue, Vine City and Atlanta University Center. Among many other accomplishments, much of its work has centered on ensuring that as the community transforms, long-time residents who make up that very community aren’t pushed out. Its anti-displacement tax fund is a hallmark of that effort. Through philanthropic donations, the fund is bridging the difference between current and rising property taxes so that as taxes rise, residents can afford to stay in their homes. Through the Westside Summit and other collaborative efforts like the tax fund, the Westside Future Fund serves as a “community quarterback,” advocating for residents and managing resources. We’re proud to continue to be a partner to, invest in and serve with the Westside Future Fund. The Westside has been enriched by the efforts of these organizations. And their work is just a glimpse of what is taking place on the Westside. They, along with many other organizations, businesses and residents I haven’t mentioned here, are all doing their part to see the Beloved Community move from a dream to reality. Chick-fil-A’s intentional support of the Westside will continue, and the Beloved Benefit is a next step in that support. To see Dr. King’s vision realized, it will take continued financial and personal investment. But, we can get there if we continue to join in — each one doing their part, together.